I was in the middle of making another blanket and I decided I needed to put it down for some more instant gratification. Besides, I had someone in mind who I thought would really enjoy this bag! The idea came from Pinterest, of course! You can find the idea here. I couldn't find a pattern so I used the picture for inspiration. 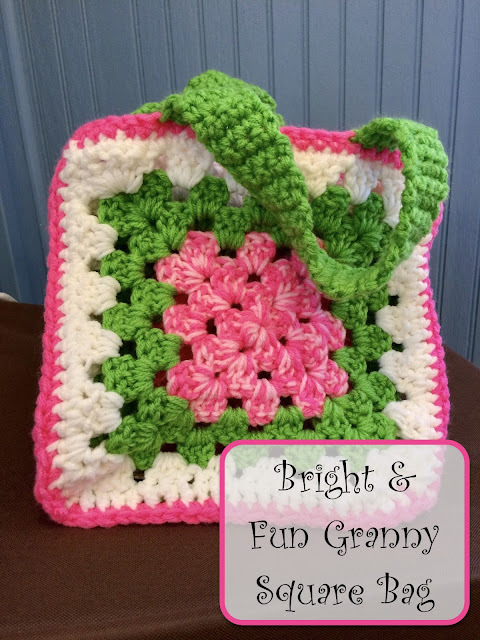 I worked up four identical granny squares using Red Heart Spring Green, White, Pretty n' Pink and Pink. I also worked one granny square of the same size in just green to use as the base. I had most of these colors left over from a blanket I had been working on. I love using what I already have. 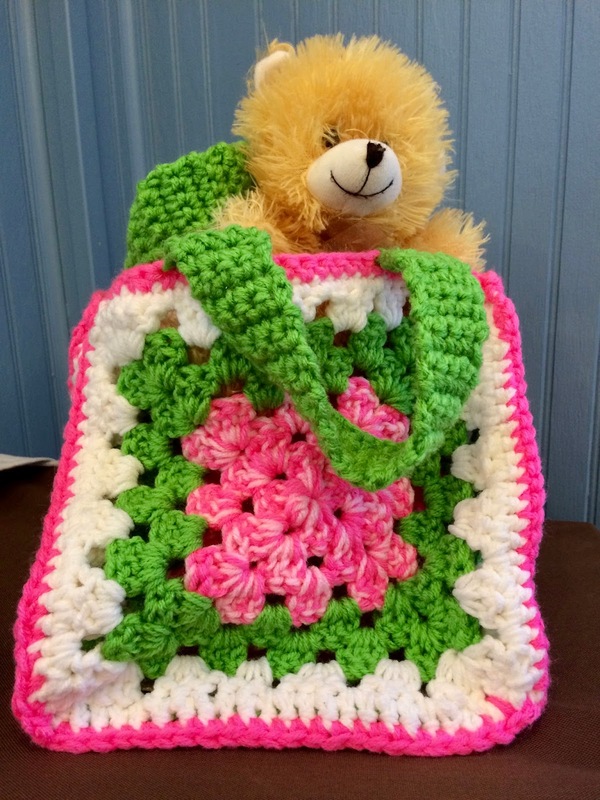 Check out this Little Girl's Handbag in the same colors. Another project using leftover yarn! My idea was to put a stuffed animal in the bag as a gift. I thought it would be a fun place to store other animals as well, almost like a storage bin. As mentioned above, I simply made 5 identically-sized granny squares. To make it more stiff, I used two strands of worsted weight yarn as one. Then I single-crocheted the squares together, a solid green one as the base. After connecting the squares, I outlined them with one more layer of pink yarn. to make the pattern pop. I found that the bag was a little floppier than I would like, so I added a square of cardboard at the bottom and sewed the top corners together a bit. This helped a lot. This is not a stiff bin, however. It definitely does have structure, but if you wanted a more solid form, you could line it with a box. 1. With one strand of Pretty n' Pink and one strand of Pink, chain four. Put your hook in the furthest chain from the hook and join with a slip stitch to make a circle. 2. Chain 2. Double crochet two into the space. Chain one. Double crochet 3, chain one. Repeat this two more times. Once you have four groups of three double crochet chain one, slip stitch to connect. Slip stitch to the corner. 3. Chain 2. Double crochet two, chain one, then double crochet three. Chain one and make two shells in each corner followed by chain one. Slip stitch to join and slip stitch to corner. 5. Using single crochet, join each square with white yarn to make a open-topped cube shape, making sure to keep the green square as the base. Once all squares are joined in the correct shape, outline in one more round of single crochet using Pretty n' Pink. 6. 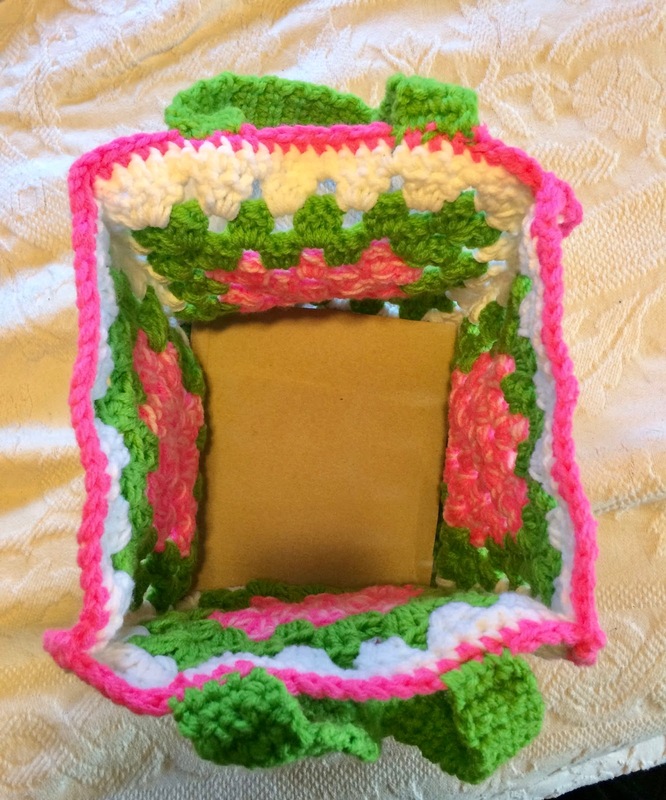 To make handles, join green yarn about one inch in from one square, and single crochet four into the top of the bag. continue until handle reaches desired length and join, using single crochet, about one inch from the other side of the same square. Repeat on opposite side. 7. If needed, pinch corners together and sew with white yarn to give more structure. 8. Cut out a square piece of cardboard and place in bottom.